BEDROCK IS THE LARGEST CONCRETE GRINDER RENTAL SUPPLIER IN THE NEW ENGLAND AREA! Now Selling Lavina & Husqvarna! You will be 100% satisfied with Bedrock Contractor Supplies commitment to excellence in product, dependability, our service, and pricing. We are confident that you will not want to shop anywhere else. We also stock a vast array of concrete equipment, Decorative Epoxy application supplies, and safety products for all of your job site needs. Bedrock's first priority is to supply our customers with the highest quality of professional diamond products in the industry, in addition to providing unbeatable prices for professional grade products. 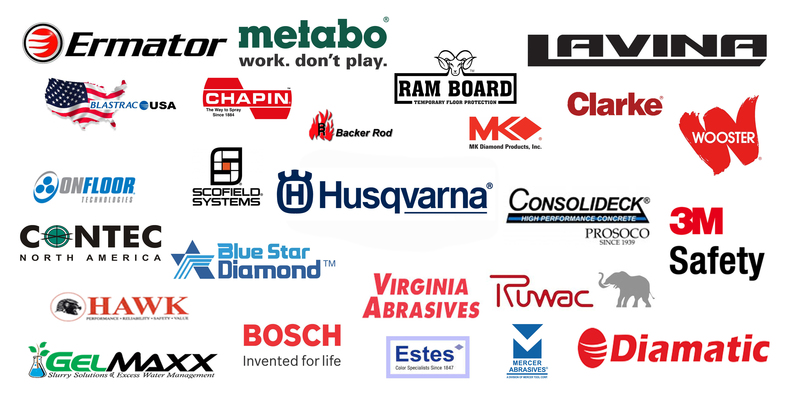 Our informed and knowledgeable sales staff and customer support representatives are happy to assist you with any questions about your diamond blade needs or the variety of products we sell. We appreciate your business and loyalty and look forward to working with you!